Most of the Quakes and Sixers will have a few days to regroup and prepare for the last 70 games of the season. But a handful are heading to San Jose for Carolina-California League festivities to be hosted by the San Jose Giants on Tuesday. The Sixers (37-33), an affiliate of the Angels, have four players named to the team. They are pitchers Mark Sappington and Kramer Sneed, infielder Alex Yarbrough and outfielder Zach Borenstein. Sappington and Borenstein will not play. Borenstein, who originally planned to take part in the Homerun Derby, injured his knee legging out a double in Saturday’s game at High Desert. The Quakes (31-39), the Dodgers affiliate, will be represented by outfielder Noel Cuevas and third baseman Ryan Mount, although mount is also injured and won’t take part. The Carolina League won last year’s game 9-1. It was held at Winston-Salem. This will be the 17th meeting between the two. The series is deadlocked at 7-7-2. The second half of the season gets underway on Thursday. The Quakes will start out at Lancaster while the Sixers will host Lake Elsinore. Drew Heid led off the bottom of the 11th inning with a home run, giving the Sixers (8-5) a 7-6 victory over the Modesto Nuts at San Manuel Stadium on Wednesday. The win boosted the Sixers (8-5) into a tie for first place in the South Division with the High Desert Mavericks (8-5), who lost at Lancaster. Manny Flores pitched eight shutout innings and he combined with Nick Pugliese on a six-hitter as the Quakes blanked San Jose 4-0 in Game 4 on Sunday night at the Epicenter, evening the best-of-five Championship Series at two games apiece. The pitching matchup for Game 5 will decide whether the Quakes win their first league title since 1994 or San Jose repeats as league champions. 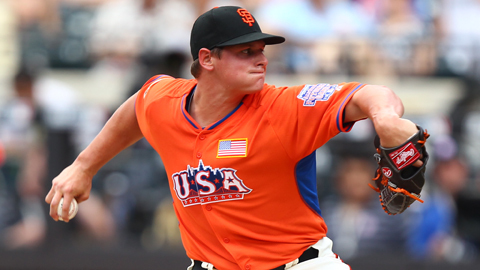 On one hand, is Quakes right-hander Kyle Hurst, who hasn’t pitched since Sept. 3. The Quakes haven’t needed him to pitch since they swept High Desert in 2 games and ousted Lake Elsinore in Game 4 of the best-of-five South Finals. Hurst’s overall numbers aren’t impressive. He had a 5-3 record and a 5.31 ERA in the regular season. But, he was 4-0 with a 2.73 ERA in his final four starts in the regular season. His one appearance against San Jose? Don’t ask. 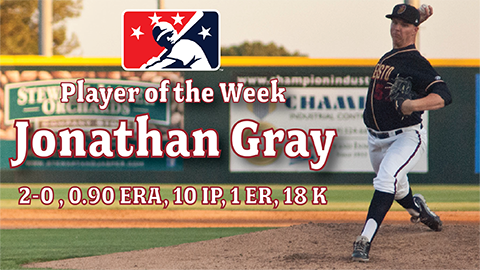 It was June 1 at San Jose and he allowed eight earned runs in 1 1/3 innings in a spot-start. But that was long before he started to figure things out. San Jose right-hander Justin Fitzgerald, who pitched seven shutout innings in Game 1, will pitch on three days rest in Game 5. That’s almost unheard of in the minor leagues, even in the playoffs. Fitzgerald was 10-6 with a 3.45 ERA in the regular season, but never even pitched with as few as four days off between starts in the first half. In the first half he had at least five or six days off between each of his starts. In the second half, it was four or five. Between his first two playoff starts, he had four days off. This is the 24-year-old Fitzgerald’s third pro season and the first pro season in which he started. So he has never started on three days rest as a pro. After a stirring rally from 3 runs down in the ninth to send the game into extra innings the Quakes couldn’t rally from a five-run deficit in the 11th and lost 12-7 in Game 3 on Saturday night at the Epicenter. San Jose’s win puts the Giants one win away from back-to-back titles. Game 4 is Sunday at the Epicenter at 5:05 p.m.
With the score tied 7-7 in the top of the 11th, Jose Perez (0-1) came in to pitch for the Quakes. Perez had retired San Jose in order in his only inning in Game 2 and he struck out Francisco Peguero to begin the inning. But catcher Alberto Rosario couldn’t handle the pitch and Peguero reached on the passed ball. Juan Perez sacrificed Peguero to second and Jose Flores tripled to right center, giving San Jose the tie-breaking run. Johnny Monell, already with three home runs in the series, was intentionally walked and then Charlie Culberson was un-intentionally walked to load the bases. Brandon Crawford then unloaded a grand slam to center field and suddenly it was 12-7. Perez retired the next two batters but the damage was done. The Quakes only got one runner on in the bottom half of the inning. The Quakes rallied in the ninth in improbable fashion. 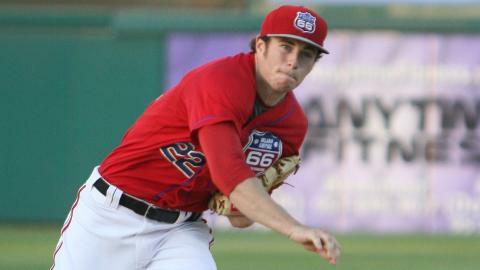 Jon Townsend led off the inning by striking out, but reached first on a wild pitch. With one out, Darwin Perez walked and Mike Trout singled to right-center to score Townsend. It was the Quakes’ only hit in 12 at-bats with runners in scoring position. Right fielder Peguero bobbled the ball to send Perez to third and Trout to second and when center fielder Juan Perez’s throw to the infield skipped all the way through, Perez scored and Trout took third. Alberto Rosario’s suicide squeeze bunt scored Trout barely under the throw, tying the score 7-7. In the 10th, the Quakes had a golden opportunity to win the game. Gabe Jacobo led off with a single and with one out, Angel Castillo got his first hit in 12 at-bats in the series to send Jacobo to second. But Townsend grounded into an inning-ending double play, sending the game to the 11th. After Game 1 of the South Finals when the Quakes lost 5-0 to Lake Elsinore and made seven errors in the process, Quakes fans were concerned. But the Quakes came back to win the next 3 games. In Game 1 of the Cal League Championship Series on Thursday, the Quakes fell 10-0 at San Jose. Both games the Quakes had defensive issues. They didn’t have 7 errors on Thursday, but the 2 errors they did have led to six unearned runs. Both starters (Garrett Richards against Lake Elsinore and Orangel Arenas on Thursday) pitched well enough to win. The defense and hitting were worse against Lake Elsinore (they showed little life on offense), but the pitching was worse on Thursday. Although an error by left fielder Eric Oliver opened the door to five unearned runs in the seventh, Arenas (and then reliever Christian Scholl) were unable to make the big pitches to mimize damage. Scholl then gave up three more runs (one unearned) in the eighth. The bottom line is, the Quakes showed the ability to overcome 1 bad game. That Lake Elsinore game was more than double the previous most errors they had in any game this season (three), but they recovered. Game 2 Friday will be a good indication of whether they’re able to repeat the magic of the Lake Elsinore series.